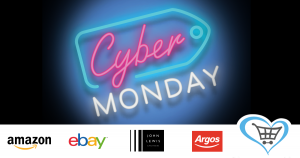 Today is Cyber Monday and it is a perfect opportunity to raise funds for our small charity whilst shopping online. Every day is a perfect day in fact – Christmas shopping, grocery shopping, shopping for clothing, household items, gadgets, toys, office supplies, pet supplies, holidays, flights, days out – you name it!! You can sign up here. It won’t cost you any extra. There are some useful apps and browser adds on that will make life easier.